Last Oct, I received an invite from Leigh wanting to know if I was interesting in joining an expedition of deep wreck diving off the South coast of Sardinia. I didn’t need to be asked twice. 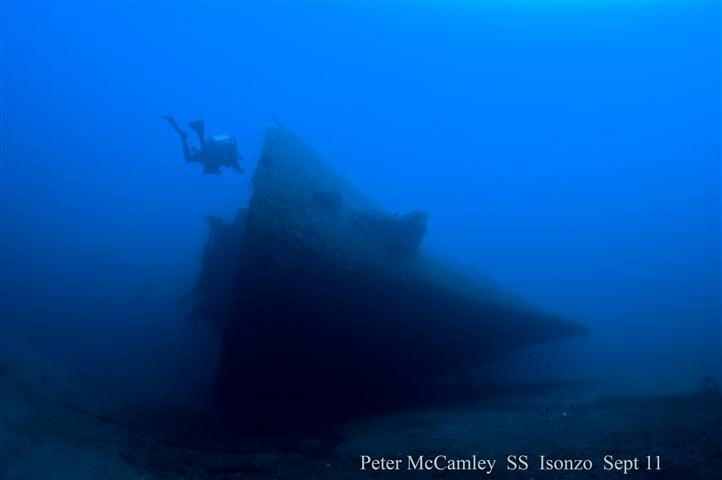 The planned wrecks would vary in size from 500 to 5000 Tonne in depths from 40 to 110 mtrs . All the wrecks would be WW2 Italian marine war machines, with the exception of one American P221 Patrol boat..
with Sally, Keith and Jason arriving from the UK, all OC. Direct flights from Stanstead to Cagalari with Easyjet were £54 return. Unfortunately, I had to delay to 26th Sept, before I could join the trip. of 30 meters from the Hotel to the Dive Centre next door. There is also a couple of 10 meter Rib that can also take 6-8 Tec Divers. door of the Dive centre. from the Dive Centre and vary in size and depth. This is what I saw during my five days. and the volume of stuff to see and that’s before you head inside. Temp on the surface with 14-16 degrees at depths below 40 mtrs. your winter woollies if you intent to do decent bottom time. know as soon as some of it hits U Tube. diving 330E. (We supplied the lime) This included our gas, cylinder rental, and boat trips. devastation that was caused when the impact occurred. Bert, for dropping us with pin point accuracy on every occasion. ROMAGNA 33 to 43 mt. PRUA del ROMAGNA 38 to 43 mt. LT 221  38 to 49 mt. CHIATTA of LT221 50 to 53 mt. ISONZO 38 to 57 mt. LOREDAN 53 to 64 mt. MARTE (SALPI) 50 to 60 mt. VALDIVAGNA 60 TO 75 MT. BENGASI 86 to 96 mt. SAN MARCO 97 to 107 mt. My God last week's diving was unbelievable. I have just returned from Malta after a week of diving that was amongst the best I have ever done. They say that your life is made up of days that you can remember; well these past few days will stay locked in for a long time to come. For anybody thinking of doing MOD 2 or 3, Matrix diving must be looked at before you make your final decision on where to go. Last week when we were there, both Richie Stephenson and Jack Ingle were teaching courses and or organising trips. It was 12 mid day on Sat 02nd April 11, when we all met up at Belfast International Airport. http://www.divingmatrix.co.uk/ and Al Wright in Malta for a week of Mod 2 Training. There were originally 12 divers, some from the Newry SAC, Belfast SAC and Enniskillen SAC. At the last minute one of the lads could not make it. Gerry Brown and Jimmy Lyons both OC Trimix divers for the past 7 years, and founder members of our Club, were now doing their MOD 2 with Paul Toomer. Mickey Whitley, Sean Farquahson, Stephen Weir and Frank McDermott were doing their MOD 2 with Al Wright http://www.salutay.co.uk/www.salutay.co.uk/Welcome.html. Alan and Freda are back in action all next year on Salutay and organising trips to Donegal and The Isle of Man. Liam Ferguson, Tomas O Dubhain, Al Cranson and Daniel Torley had decided to come in order to do OC Diving. Alan Cranston is one of the finest underwater photographers that I have ever been in the company of. Due to the fact that the Aquatica housing for my D90 had just arrived, I had a great craic with him about white balances, shutter speeds, apertures Photoshop etc etc etc.